Tired of flicking through channels?? Are you bored of watching the same infomercials over and over again?? Well, have I got news for you?!?! Tune into Netflix every Tuesday and dive into the exciting world of law and justice with none other than Saul Goodman in “Better Call Saul”. The creators of the hit US TV series ‘Breaking Bad’ Vince Gilligan and Peter Gould present a prequel and invite fans of the series, as well as newbies alike to understand; evaluate, and witness the rise and fall of laid back attorney Saul Goodman – shadow man of Kingpin drug dealer and chemistry teacher in disguise Walter White. The series uses Saul’s playful nature towards life, and somewhat obnoxious behavior towards his misfortune. It’s as if Saul carries a black cat with him at all times and doesn’t even know it. That’s if you believe in superstition of course. The opening is a very clever one. If you’re familiar with the ‘Breaking Bad ego system; you’d also know establishing shot of episodes have a tendency to be abstract. We see an employee cutting bakery goods into Swiss rolls in bird’s eye view. Filtered in black and white, a young man in glasses comes into frame. He works at a café wearing the appropriate attire. He resembles the lead character Saul (Bob Odenkirk), however as an observer, I’m not sure. Minding his own business, a mysterious man approaches the counter. The worker looks up only when he catches this mystery man in his proverbial vision. He’s obviously unsettled by his presence. He tracks the customer until he leaves the building. ‘Address Unknown’ by The Ink Spots used in this sequence seems pretty appropriate. The sequences of events are a mystery yet to be discovered. The unidentified man comes home from work and sits on the couch staring at the TV. He’s watching reruns of Saul Goodman’s infomercials. 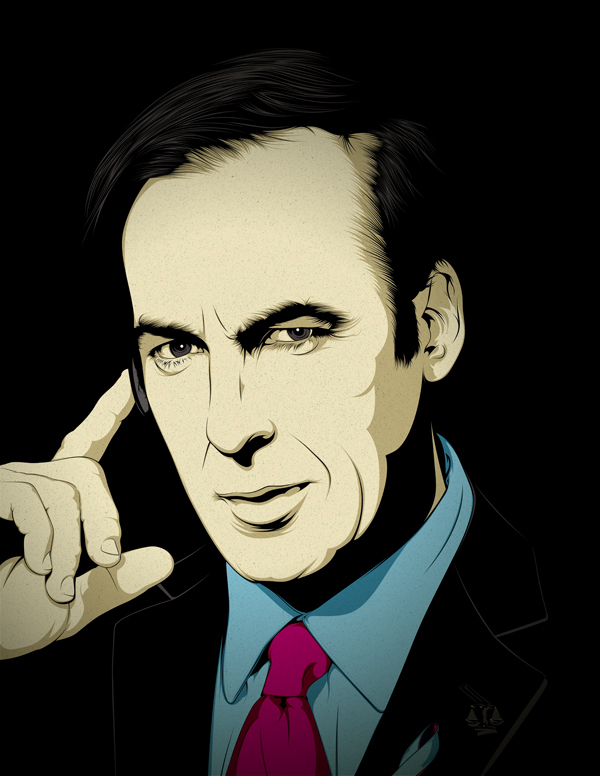 With this in mind, as a viewer, I can’t help but identify this man as Saul Goodman himself. The black and white filter could represent a flash forward. What we’re seeing now could be events that’ll happen later on in the series. Why? Because, we’ve seen a similar pattern occur with Breaking Bad’s first few episodes too. The first episode introduces a new set of characters. One of them being Chuck identified as a shareholder of Harold Hamlin & McGill, (HHM) a reputable law firm. That being said, we do see Mike (Walt’s go to guy whenever things were an uphill struggle). He works at a ticket booth for Saul’s workplace. Saul and Chuck’s relationship isn’t revealed until later on in the series. Since they live together, we have room to assume their relationship is close; they’re inseparable. In his early days as an attorney of law, Jimmy McGill, a.k.a. Saul Goodman doesn’t really have a great track record or reputation. He’s a phony. Potential clients see him as a conmen. From Goodman’s point of view, new faces are potential clients. Giving up is never an option for Goodman. He tries every trick in the book, just so he could represent clients he meets but his efforts fail to work to his advantage. No matter how difficult the task, it never seems to leave Goodman feeling tentative. Saul is determined to better the CEO / co-founder of Harold Hamlin & McGill (HHM). Everything is an uphill struggle for Jimmy McGill. He spends most of his life convincing people he cared for, and potential customers he’s a legitimate lawyer. We’ve already seen Saul cross paths with thugs and men Braking Bad fans are familiar with. Better Call Saul is funny, well written and well scripted. It delivers a riveting story that leaves audiences wanting more. Better Call Saul thus far, does its Godfather, Breaking Bad justice!